The Department of Kinesiology loves to recognize our outstanding faculty members. Read more on Dr. Pam Kocher Brown, and all she has done for UNCG! Pam has been at UNCG since 2000, first as a graduate student and now as an Academic Professional Professor. She earned her Bachelor of Science in Physical Education with licensure and a minor in Biology from the State University of New York College at Cortland, her Masters of Art in Exercise and Sport Science with a focus on Cardiac and Pulmonary Rehabilitation from the University of North Carolina at Chapel Hill, and her Doctor of Education from the University of North Carolina at Greensboro. She served as the aquatics director at UNC Chapel Hill, and as the women’s soccer and tennis coach, senior women’s administrator and faculty member at Chowan College, before returning to school at UNCG. 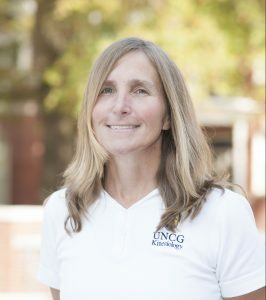 She has been on the UNCG faculty since 2003 and has taught a wide variety of classes including activities classes and several in the KIN core, and she served as the coordinator for the physical education and health teacher education program for 7 years. She is active in service both at the university and professionally. She is married and has three children who are all active in sports. What do you enjoy about being part of the UNCG KIN department? I feel like through my role as the director [in the online EdD in Kinesiology program] I have been given a chance to really make a difference in the world by helping my students’ achieve their goals. Our EdD in KIN program is designed for individuals who are working so that they can immediately apply what they are learning into their daily lives – students regularly comment about how they have used a lesson or assignment they created for class in their actual workplace. A key element of the dissertations is that they are applied – we want the students to make a difference in their professional lives and potentially the lives of others with their work, so we strive for this in all they do. What are some fun experiences you have had in your professional journey? Some of the most enjoyable experiences at UNCG have been with colleagues when we have attended professional conferences. Each year I look forward to attending the conferences with my colleagues, who are also my friends. We get to learn a lot at the actual conferences but also have some fun in new cities and states – we always find ways to laugh and enjoy ourselves. In what ways have you been able to impact students in a completely online world? You would be surprised about the sense of community you can build in an online program. That is probably what people (faculty and students) are most skeptical about until they have a chance to be a part of the program. Our students talk (email, text, Google hangout, phone) with each other regularly to talk about their families as well as their academics. I often find that I know more about my online students than face-to-face because they are able to “talk” with me at times that fit versus having to run off to the next class or get to work. Ask the students and many will tell you they have made lifelong friends through the program. UNCG and especially the EdD in KIN program is really a family.